Line baking pan with tinfoil and grease. In a mixer beat butter, brown sugar, and eggs until combined. In a medium-sized bowl, combine: flour, baking powder, baking soda, and salt. Add dry mixture to wet, one third at a time. Add 1 cup of Skor pieces and the chocolate chips. Smooth batter into prepared pan. Bake for 23 min, top should be golden brown. 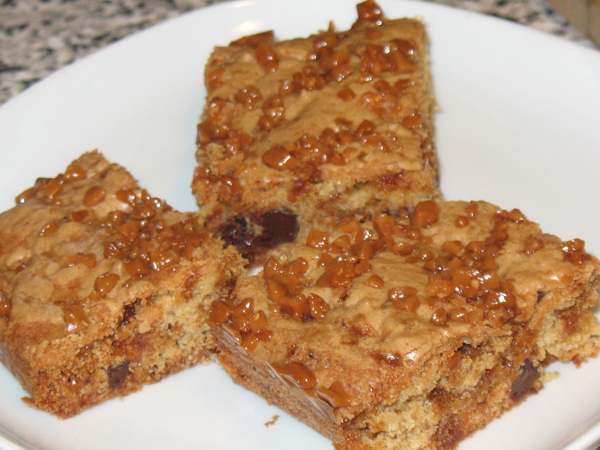 Remove from oven and immediately pour the remaining Skor pieces on top. Cool on wire rack for at least 1 hour. Peel off tinfoil and serve.